Bitcoin Is Illegal in Iceland but Could It Be the Solution They Need? Significant efforts by the government avoided bankruptcy, but the impact on the country was widespread and affected nearly every resident. During the worst week of the crisis, their stock market collapsed with a 96-percent drop (in Euro terms) in value. Pension assets dropped as much as 25 percent. Inflation was rampant and many local businesses went bust, including ​Sterling Airlines. Banks were nationalized, including one bank which was nationalized after the release of internal documents on WikiLeaks detailing the company's large loan exposure. When the crisis hit, in the search for answers, the Icelandic people took to the streets in protest. Their protests led to the resignations of top leaders of the country and reforms that put the country on track to correct itself. It also led to the jailing of individuals who had a hand in the crisis. Fast forward to 2015, when the world began to notice that Iceland had righted its ship and the country was recovering; The Washington Post published an article entitled, “The Miraculous Story of Iceland”, The Guardian reported on how “Iceland rises from the ashes of banking crisis”, and Germany’s Der Spiegel wrote how Iceland’s rise from the abyss was a case study for other countries who encounter similar disasters. Among the reasons for Iceland’s success included its ability to let its banks go bust, implement widespread austerity measures and the fact that Iceland had its own currency, which it devalued. The country also implemented many new controls on the banking and monetary systems to address the crisis. These measures include high taxes on the residents (and travelers), the continued inability for foreign investors to remove assets that were stuck in the country from the crisis, and even controls on bankers’ bonuses. One of the controls that’s often overlooked in writings about the Iceland “miracle” is the government’s decision to make the exchange of Bitcoin illegal in the country. Although Iceland is home to some of the largest Bitcoin mining facilities in the world, the Icelandic government made the following decision on Bitcoin (released in 2013 but it’s seen to be a residual effect of legislation to address the 2008 crisis), “It is prohibited to engage in foreign exchange trading with the electronic currency Bitcoin, according to the Icelandic Foreign Exchange Act. A written response from the Central Bank of Iceland to Morgunblaðið states that the Foreign Exchange Act specifies general restrictions on foreign exchange trading and capital movements between countries. These rules seemed to allow for Icelandic citizens to own bitcoin and allow for the mining of bitcoin in Iceland. What they're designed to do, however, is to stop the capital flight of funds (in the form of bitcoin) out of the country. This essentially means that bitcoin is not a currency according to Icelandic law. Now, fast forward to recent times (and a new and Icelandic financial crisis). In early April of 2016, millions of documents were leaked from a Panamanian law firm that detailed how the rich and powerful were hiding their assets from taxes and public scrutiny. These documents, now called the Panama Papers, revealed the names of world leaders including Russia's Putin and UK’s David Cameron on these accounts. Neither of these leaders h​as stepped down, but the first leader to step down due to their name being revealed in these documents was Iceland’s Prime Minister. When the Panama Papers were revealed, many other countries took the news as just another example of their leaders doing what they want, but the Icelandic people were having none of it. 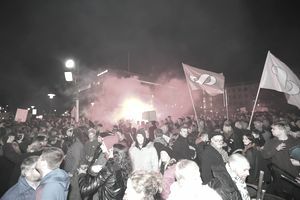 They took to the streets almost immediately after they were revealed and demanded their Prime Minister’s resignation. As stated earlier, Iceland is a beautiful country. But perhaps, its most beautiful aspect is its people. The sight of such a large amount of residents gathering peacefully (with no pepper spray incidents) to protest issues of financial manipulation, fraud and deceit from its leaders, is just another example of how the Icelandic people are actively, and peacefully, addressing change in their country. Icelandic politics are very interesting for an outsider to observe. The leading political party in the country is now the Pirate Party, which is part of an international movement focused on supporting issues such as internet and data freedom. In 2013, members of the party drafted a law that Edward Snowden be granted Icelandic citizenship. This possibility hasn’t been lost on those within Iceland. In 2014, the cryptocurrency Auroracoin was launched within Iceland as an alternative to Bitcoin and the Icelandic krona. Auroracoin was created as an alternative cryptocurrency to address the government restrictions of capital flight outside of the country and the prohibition of the foreign exchange of bitcoin from the country. The success of this alternative to Bitcoin within Iceland has been subdued, even after an airdrop of 50 percent of the cryptocurrency to Icelandic citizens. Much of this has to do with the lack of clarity about the legality of this digital currency within the country, which can be exchanged for bitcoins. Now with the release of the Panama Papers, recent protests and calls for change by Icelanders countrywide, the question becomes, why not just make Bitcoin legal? It’s clear that Auroracoin was created as a substitute for Bitcoin, which was considered illegal in the country. Many in the country are recognizing the impact and opportunity of the internet, including the many who are profiting from the Bitcoin mining efforts taking place there. The country is not part of the EU and not beholden to an outside currency. The Icelandic government and its people have already shown that they're willing to make drastic changes to improve their economy. How Could Bitcoin Benefit Iceland? Many criticize Bitcoin as a vehicle for money laundering and crime. The reality is that widespread adoption of Bitcoin could help to fight financial crime. It’s important to note that Bitcoin is pseudonymous, not anonymous, and that all transactions are ultimately public and accessible to anyone. The lack of transparency that people hoped for with Panamanian accounts wouldn’t actually occur with Bitcoin. The implementation of Bitcoin by a country could be a more cost-efficient way to maintain a currency than existing methods. Done digitally, there’s no need for paper or physical coins. This would also position the country as a leader in the implementation of Blockchain technology, which has many benefits for governmental activities, including improved record keeping. One of the most important aspects of freeing Bitcoin in Iceland may be the ability to create the country as a “hot bed” for business growth around Bitcoin and the Blockchain. This would help to stimulate high-tech growth in the country and bring in expertise from the rest of the world. No country has truly taken the step of approving Bitcoin as a national currency and although there may be many benefits for Iceland, this article is not an exhaustive view of how the digital currency could help, or hinder the country’s economy. Given the country's general mood to examine the status quo and institute positive fiscal change in the country, it may be advantageous for Iceland to at least consider creating an internal task force to examine the issue of Bitcoin and making it legal in the country. This should be driven by those in the country, and if there’s an interest in seeking outside assistance and expertise on the topic, expect many foreigners to step up in order to visit this beautiful country and meet its progressive citizens.